Blackberry is the common name for any of the various perennial plants of the genus Rubus and subgenus Rubus (or Eubatus) with compound leaves and bearing aggregate fruit of numerous drupelets ripening to a black or dark purple fruit. The term also is used for the fruit of these plants, which is called a "blackberry," although technically it involves numerous drupelets around a central core. 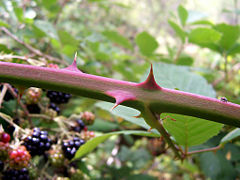 Blackberry plants, whose stems may be covered with thorns, also are called brambles. The genus Rubus also includes raspberries, although in raspberries and other species of the subgenus Idaeobatus, the drupelets separate from the core when picked, leaving a hollow fruit, whereas in blackberries the drupelets stay attached to the core. However, as common names, the terms raspberry and blackberry are used imprecisely. For example, Rubus fruticosus in subgenus Rubus is both know as blackberry and bramble raspberry. The subgenus Rubus (or Eubatus) also includes the dewberries, whose fruit is also purple or black, but whose stems trail along the ground, rather than more upright and arching as generally with the blackberries. The European dewberry, Rubus caesius, grows more upright like other brambles and its fruits are coated with a thin layer or 'dew' of waxy droplets. Some consider the dewberries simply a variety of blackberry. Blackberries, as with other animal-pollinated flowering plants, provide a popular example of the harmony in nature. The blackberry flowers provide a nectar source for bees, while the bees carry out pollination, allowing the plants to produce fruit. The plants also provide an important service for other members of the ecosystem, providing black bears, birds, and other animals with food, and offering both culinary and medicinal values for humans. The blackberries' special combination of taste, form, color, and texture provides a unique experience for humans in the joy they receive from nature. Rubus is a genus of plant in the family Rosaceae, which is one of the largest families of flowering plants with about 3,400 species. The Rosaceae family includes apples, berries, peaches, plums, cherries, the hawthorn tree, the mountain ash, and many others. Within the family Rosaceae, the genus Rubus is a very complex one, comprising 13 subgenera and more than 300 known species. The raspberries, blackberries, and dewberries are common, widely distributed members of the genus, and loganberries and boysenberries are also members of the genus. Most of these plants have woody stems with prickles like roses; spines, bristles, and gland-tipped hairs are also common in the genus. The blackberries, as well as various other Rubus species with mounding or rambling growth habits, are often called brambles. However, this name is not used for those like the raspberry that grow as upright canes, or for trailing or prostrate species such as most dewberries, or various low-growing boreal, arctic, or alpine species. In various parts of the United States, wild blackberries are sometimes called "black-caps," a term more commonly used for black raspberries, Rubus occidentalis. The Rubus fruit, sometimes called a bramble fruit, is an aggregate of drupelets. A drupe is a fruit in which an outer fleshy part (exocarp, or skin; and mesocarp, or flesh) surrounds a shell (the pit or stone) of hardened endocarp with a seed inside. These fruits develop from a single carpel, and mostly from flowers with superior ovaries. The definitive characteristic of a drupe is that the hard, lignified stone (or pit) is derived from the ovary wall of the flower. In an aggregate fruit composed of small, individual drupes, each individual is termed a drupelet. 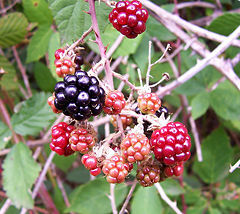 Bramble fruits (such as the blackberry or the raspberry) are aggregates of drupelets. The fruit of blackberries and raspberries comes from a single flower whose pistil is made up of a number of free carpels. In the blackberry, the drupelets are attached to an elongated core that is removed with the fruit. In raspberries, the drupelets separate from the core when picked, such that the aggregate fruit has a hollow core. The blackberries are a widespread and well known group of several-hundred species, a number of which are closely related apomictic microspecies, native throughout the temperate Northern Hemisphere (Huxley 1992). Apomixis (also called apogamy) is asexual reproduction, without fertilization. Apomictically produced seeds are genetically identical to the parent plant. As apomictic plants are genetically identical from one generation to the next, each has the characters of a true species, maintaining distinctions from other congeneric apomicts, while having much smaller differences than is normal between species of most genera. They are therefore often called microspecies. In some genera, it is possible to identify and name hundreds or even thousands of microspecies, which may be grouped together as aggregate species, typically listed in Floras with the convention "Genus species agg." (e.g., the bramble, Rubus fruticosus agg.). Blackberries are perennial plants that typically bear biennial stems ("canes") from the perennial root system. In its first year, a new stem grows vigorously to its full length of 3-6 meters, arching or trailing along the ground and bearing large palmately compound leaves with five or seven leaflets; it does not produce any flowers. In its second year, the stem does not grow longer, but the flower buds break to produce flowering laterals, which bear smaller leaves with three or five leaflets. First and second year shoots are usually spiny, usually with numerous short curved very sharp spines (spineless plants also occur). The flowers are produced in late spring and early summer on short racemes on the tips of the flowering laterals. Each flower is about 2-3 centimeters in diameter with five white or pale pink petals. The newly developed primocane fruiting blackberries flower and fruit on the new growth. As noted for Rubus species in general, the fruit, in botanical terminology, is not a berry, but an aggregate fruit of numerous drupelets ripening to a black or dark purple fruit, the "blackberry." The early flowers often form more drupelets than the later ones. This can be a symptom of exhausted reserves in the plant's roots, marginal pollinator populations, or infection with a virus such as raspberry bushy dwarf virus (RBDV). Even a small change in conditions, such as a rainy day or a day too hot for bees to work after early morning, can reduce the number of bee visits to the flower, thus reducing the quality of the fruit. The drupelets only develop around ovules that are fertilized by the male gamete from a pollen grain. The blackberry tends to be red during its unripe ("green") phase, hence the old expression that "blackberries are red when they're green." Unmanaged mature plants form a tangle of dense arching stems, the branches rooting from the node tip when they reach the ground. They are very vigorous, growing at fast rates in woods, scrub, hillsides and hedgerows, covering large areas in a relatively short time. The blackberry will tolerate poor soil, and is an early colonist of wasteland and building sites (Blamey and Grey-Wilson 1989). Blackberry leaves are also a food for certain Lepidoptera caterpillars. Since the many species form hybrids easily, there are many cultivars with more than one species in their ancestry. Numerous cultivars have been selected for commercial and amateur cultivation. Recommended cultivars in the United Kingdom include 'Ashton Cross' (vigorous, thorny), 'Bedford Giant' (heavy cropping, vigorous, thorny), 'Black Satin' (vigorous, thornless), 'Dirksen' (thornless, very hardy), 'Thornless Evergreen' (heavy crops of high quality fruit; thornless), 'Fantasia' (very large fruit; vigorous), 'Hull Thornless' (heavy cropping), 'Loch Ness' (thornless, semi-erect canes), 'Marion' (vigorous, thorny; good flavor), 'Smoothstem' (thornless), and 'Thornfree' (moderate vigour, thornless) (Huxley 1992). Marion (marketed as 'Marionberry') is an important cultivar and is from a cross between 'Chehalem' and 'Olallie' (commonly called "olallieberry") berries. The 'Marionberry' was introduced by G.F. Waldo with the Agricultural Research Service (USDA-ARS) in Corvallis, Oregon in 1956. Adapted to western Oregon, the 'Marionberry' is named after Marion County, Oregon, in which it was tested extensively. 'Olallie', in turn, is a cross between loganberry and youngberry. 'Marion', 'Chehalem', and 'Olallie' are just three of the many trailing blackberry cultivars developed by the United States Department of Agriculture Agricultural Research Service (USDA-ARS) blackberry breeding program at Oregon State University in Corvallis, Oregon. The most recent cultivars released from this program are the thornless cultivars 'Black Diamond', 'Black Pearl', and 'Nightfall', as well as the very early ripening 'Obsidian' and 'Metolius'. Some of the other cultivars from this program are 'Waldo', 'Siskiyou', 'Black Butte', 'Kotata Berry', 'Pacific', and 'Cascade'. Trailing blackberries are vigorous, crown forming, require a trellis for support, and are less cold hardy than the erect or semi-erect blackberries. In addition to the Pacific Northwest of the United States, these types do well in similar climates such as the United Kingdom, New Zealand, Chile, and the Mediterranean countries. Semi-erect, thornless blackberries were first developed at the John Innes Centre in Norwich, United Kingdom, and subsequently by the USDA-ARS in Beltsville, Maryland. These are crown forming, very vigorous, and need a trellis for support. Cultivars include 'Black Satin', 'Chester Thornless', 'Dirksen Thornless', 'Hull Thornless', 'Loch Ness', 'Loch Tay', 'Merton Thornless', 'Smoothstem', and 'Triple Crown'. Recently, the cultivar 'Cacanska Bestrna' (also called 'Cacak Thornless') has been developed in Serbia and has been planted on many thousands of hectares there. The University of Arkansas has developed cultivars of erect blackberries. These types are less vigorous than the semi-erect types and produce new canes from root initials (therefore they spread underground like raspberries). There are thornless and thorny cultivars from this program, including 'Navaho', 'Ouachita', 'Cherokee', 'Apache', 'Arapaho', and 'Kiowa'. 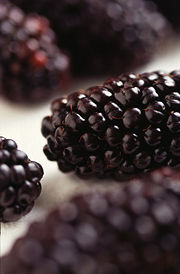 They are also responsible for developing the primocane fruiting blackberries. In raspberries, these types are called primocane fruiting, fall fruiting, or everbearing and have been around for some time. Prime-Jim and Prime-Jan were released in 2004 and are the first cultivars of primocane fruiting blackberry. They grow much like the other erect cultivars described above; however, the canes that emerge in the spring will flower in mid-summer and fruit in late summer or fall. The fall crop has its highest quality when it ripens in cool climates. 'Illini Hardy', a semi-erect thorny cultivar introduced by the University of Illinois, is cane hardy in zone 5, where traditionally blackberry production has been problematic, since canes often failed to survive the winter. Blackberry production in Mexico has exploded in the past decade. While this industry was initially based on the cultivar 'Brazos', it is now based on 'Tupi'. Brazos was an old erect blackberry cultivar developed in Texas in 1959. Tupi was developed in Brazil and released in the late 1990s. Tupi has the erect blackberries 'Comanche' and 'Uruguai' as parents (Antunes and Rassieira 2004). In order to produce these blackberries in these areas of Mexico where there is no winter chilling to stimulate flower bud development, chemical defoliation and application of growth regulators are used to bring the plants into bloom. As there is forensic evidence from the Iron Age Haraldskær Woman that she consumed blackberries some 2,500 years ago, it is reasonable to conclude that blackberries have been eaten by humans over thousands of years. Today, blackberries are consumed fresh, or used in prepared foods, such as desserts, jams, seedless jellies, yogurt, and sometimes wine. In addition, blackberry flowers are good nectar producers, and large areas of wild blackberries will yield a medium to dark, fruity honey. Medicinally, blackberries also have a long history, having been used by Europeans for such purposes for at least 2,000 years (Anderberg). People would chew the leaves or made tea out of blackberry shoots to relieve mouth ailments, bleeding gums, and cancer sores (Anderberg). From Greek doctors to American Indians, the blackberry plants were used medicinally for such purposes as to stop diarrhea or for mouth ailments (Anderberg). They also have been used to prevent or treat scurvy. Blackberry stems also have been used by American Indians to construct a strong rope, and at various times in human history parts of the plant (berries, leaves, roots) have even been used to dye hair and fabrics (Anderberg). In some parts of the world, such as in Chile, New Zealand and the Pacific Northwest region of North America, some blackberry species, particularly Rubus armeniacus (syn. 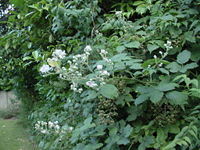 R. procerus, 'Himalaya') and Rubus laciniatus ('Evergreen') are naturalized and considered an invasive species and a serious weed (Huxley 1992). 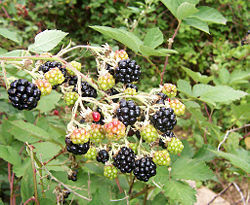 Superstition in the UK holds that blackberries should not be picked after Michaelmas (September 29) (sometimes the deadline is given as October 10) as the devil has claimed them, having left a mark on the leaves variously attributed to striking them, trampling them, spitting on them, or urinating on them, among other versions. There is some value behind this legend as after this date wetter and cooler weather often allows the fruit to become sour and watery and infected by various molds, such as Botryotinia, which give the fruit an unpleasant look and may be toxic (Simpson 2003; Conkers and Ghosts; Barlow 2008). Anderberg, K. n.d. Blackberries for food, tea, medicine, rope, ink, and more!. Herbal Information & Homemade Cosmetics Reciples. Retrieved April 10, 2008. Antunes, L. E. C., and M. C. B. Raseira. 2004. Aspectos Técnicos da Cultura da Amora-Preta. Pelotas, RS: Embrapa Clima Temperado. ISSN 1516-8840. Barlow, M. 2008. British culture: Facts about September. Woodlands Junior School. Retrieved April 10, 2008. Blamey, M., and C. Grey-Wilson. 1989. The Illustrated Flora of Britain and Northern Europe. London : Hodder &amp;amp;amp;amp;amp; Stoughton. ISBN 0340401702. Conkers and Ghosts. n.d. Traditional customs and folktales for September. Conkers and Ghosts. Retrieved April 10, 2008. Food Standards Agency (FSA). n.d. Eat well, be well. Food Standards Agency. Retrieved August 15, 2007. Grieve, M. 1971. A Modern Herbal. New York, Dover Publications. ISBN 0486227987. Huxley, A., (Ed.) 1992. The New Royal Horticultural Society Dictionary of Gardening. Macmillan ISBN 0333474945. Simpson, J. 2003. A Dictionary of English Folklore: Includes Over 1250 Entries. Oxford: Oxford Univ. Press. OCLC 163167070. University of Georgia Botanical Information. From Idea to Supermarket:The Process of Berry Breeding Article from USDA on berry breeding including pictures of blackberry emasculation and pollination. This page was last modified on 13 June 2016, at 18:35.